Christophe Moreau of Caisse d’Epargne has announced his intention to retire at the end of the current season, according to l’Equipe. The 39-year-old Frenchman, who has been a professional since 1995, is the oldest rider in this year’s Tour de France and announced his decision during a rest day press conference in Morzine-Avoriaz. Although he now feels that it is time to hang up his wheels, Moreau, who is nicknamed “le chien” (the dog) because of the distinctive “tongue-out” expression he wears when he is suffering on a climb or in a time trial, will not be stopping immediately after the Tour. Moreau turned professional with the Festina team in 1995, where he showed early promise finishing second in the Tour de l’Avenir. Like most of the riders on that team though, he was embroiled in the scandal that rocked the sport during the 1998 Tour de France. He admitted using EPO and was suspended for six months. As one of the few high-profile riders to stay with Festina after the scandal, Moreau’s best year came in 2000 when he finished 4th overall in the tour de France. The next year he won the Critérium du Dauphiné Libéré and started the Tour with high hopes, winning the prologue to take the first yellow jersey; things didn’t go to plan though and he abandoned on stage 12. After Festina withdrew from the sport, he signed for the Credit Agricole team from 2002, where he was to experience mixed fortunes once more. He abandoned the 2002 Tour, but returned to finish 8th in 2003. After an injury delayed 2004 season he returned to finish 12th in the Tour, once again the best French finisher. In 2005 he finished 11th, but the team did not renew his contract and he signed for the AG2R-Prevoyance team for the next year. He stayed at Vincent Lavenue’s team for two seasons, finishing the 2006 Tour in 7th; he repeated his Dauphiné Libéré win in 2007, including a stage win on Mont Ventoux, and became French road champion for the first and only time in his career. 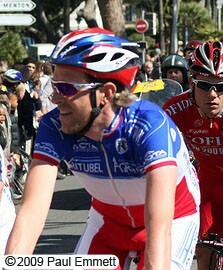 In 2008 he joined the Professional Continental Agritubel team, but his career continued its downward trend. It was thought that he might have retired at the end of last year when the team folded, but he was offered the lifeline of one more season with Caisse d’Epargne.